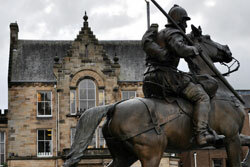 Galashiels has voted to reject a Business Improvement District (BID) in the town. To be successful, the majority of those businesses voting must be in favour of the BID and the majority measured by Rateable Value must be in agreement with the BID. 105 businesses voted in favour of the plan, representing 71% of the votes cast while 42 businesses voted against the plan, representing 29%. Measured by Rateable Value, £1.82m voted in favour – representing 38.7% of the Rateable Value vote - while £2.9m voted against, representing 61.3% of the Rateable Value vote. “While it is disappointing to hear that Galashiels has chosen not to go ahead with a Business Improvement District for the town, we understand the pressures businesses and shops are currently under and the tight budgets they need to work to. “I would pay tribute to the very significant efforts made by Energise Galashiels in seeking to deliver a BID and particularly the strong leadership provided by Craig Murray and his hard working team. This is not the result they would have wished for but they should be proud of the personal contribution they have made to the future of Galashiels. “Despite this setback, there are a number of exciting projects being taken forward in Galashiels to regenerate the town, including streetscape improvements and the Great Tapestry of Scotland Visitor Centre which will kick start delivery of the Galashiels Masterplan.